Don Tyson School of Innovation is the first high school in Northwest Arkansas to form a team. In January of 2017 we received a USLacrosse "First Stick" grant that equipped our team. 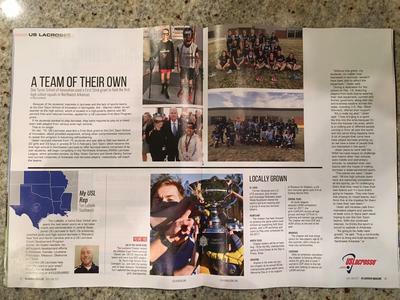 Since then we have been featured in the May/June USLacrosse magazine. We have both a girls and boys team and have challenged other areas schools to follow. That challenge seems to be working with as many as five other area school forming or considering forming teams. Next year we will become part of the Heartland Lacrosse Conference. Join in and write your own page! It's easy to do. How? Simply click here to return to Arkansas Lacrosse.